It's Friday. Let's change things up a bit by asking the following question: How low are the consumer loan interest rates in the US these days? The average mortgage rate is now 3.41%. Credit cards still charge some 14%. 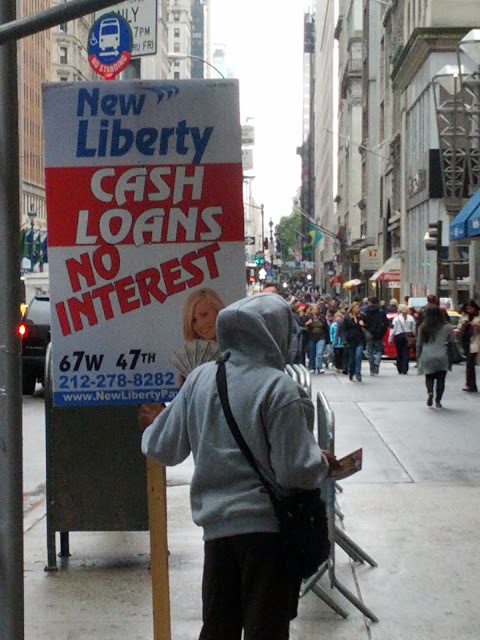 However if you walk the streets of New York City, you just might find an interest free loan. So who is New Liberty and why are they offering a no-interest loan? It turns out they call themselves "collateral loan specialists/brokers". They provide "secured lending" if the collateral is right. New Liberty: - Our mission is to provide you with professional, friendly, and expert fast service [whatever that expression means], offering you fair and favorable value for your loan, at the best competitive rates. We offer instant cash loans for gold, silver, diamonds, jewelry and watches on the spot and provide you with free verbal appraisal for your merchandise. All standard loans are issued for a 4 month period. For new clients, our interest rate on the 1st month of your loan is 0%, compared to the standard 4%, charged by our competitors. The 4% interest rate is set by New York State, and it is deemed one of the lowest rates in the country. If you decide to sell your merchandise, our affiliate owned company NY Estate Buyers will be able to buy it. Wait a minute here, this sounds like another line of business. That's right, it's a pawn shop, regulated by the city of course. Welcome to NYC where money is free - you just need to know where to look.